It's certainly a busy time for Status Quo completists, 'The Vinyl Singles Collection 1972-1979' being the first of five box-sets that will span the majority of the band's seven-inch output. This excellent looking set finding the vinyl platters housed in either the generic cut-out or bespoke picture sleeves they originally arrived in. It begins with 1972's 'Paper Plane', the band's first Top Ten hit since their brush with early Pop success, which is backed by 'Hello!' album track 'Softer Ride'. Previous label Pye Records then attempted to piggie-back onto Quo's new-found profile, but their "opportune" releases of 'Mean Girl' and 'Gerdundula' are not included here. Instead, we get the stone cold classic 'Caroline' where the exclusive B-side 'Joanne' is a sedate dreamy little Rocker that shows a different side to SQ. 'Break The Rules', from the 'Quo' album, then reached #8 in 1974 with the slightly Country-flavoured 'Lonely Night' a pleasant surprise on the flip-side. With the band firing out albums at the rate of one a year, only one single was released from each, the chart topping 'Down Down' being pulled from 1974's 'On The Level'. It's still as vibrant, exciting and memorable some forty-three years later, as is B-side 'Nightride'. Against much advice, the boys chose to celebrate their thirteenth anniversary with the 'Quo Live EP', a three track release featuring 'Roll Over Lay Down', 'Gerdundula' and 'Junior's Wailing'. It reached #9 in the charts... so much for advice. The shimmering 'Rain' fell from the sky (okay, the 'Blue For You' album) in 1976, the follow-up 'Mystery Song' likewise. The former climbed to #7 in the charts, the follow-up stalling at #11. The band would be back in the Top Ten later in the year with a cover of the Hank Thompson song 'Wild Side Of Life', a British Blues take on this Country classic being a standalone single featuring the Poppy 'All Through The Night' as an added bonus. Another cover followed, 'Rockin' All Over The World', which is possibly the most famous Quo single ever, due to the band opening Live Aid with the John Fogerty penned hit. The seven-incher finding another 'Blue...' cut, 'Ring Of A Change' on its B-side. However, it was the main track that signalled a slightly more commercial sound, something confirmed by the two releases from the 'If You Can't Stand The Heat' album, 'Again And Again' and 'Accident Prone'. 'Again...' B-side 'Too Far Gone' confirmed the shift, while 'Let Me Fly' (the B-side to 'Accident...') highlights the new-found prominence of keyboard player Andy Bown in the band. Two singles from Quo's 1979 album 'Whatever You Want' close this set out, the glorious title track soaring up to #4 with the Poppy Rock 'n' Roll of 'Hard Ride' (which was originally exclusive to this single) on its flip, before one of the sadly missed Rick Parfitt's best moments, 'Living On An Island', reached #14 with its B-side 'Runaway' bringing this excellent set to an end. 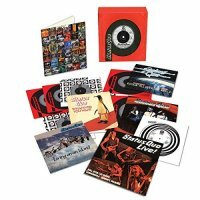 Any Status Quo fan worth his salt will have all of the music included in this set already, and yet, having the chance to own pristine new copies of these singles, housed in a beautiful box-set and with a stunning seven-inch booklet to match, is going to prove enticing. The music itself is utterly irresistible!